Buffalo was coming off a 99-94 overtime win at then-No. 13 West Virginia on Friday night, and the national ranking is the latest accolade for a program that’s been transformed since Bobby Hurley was hired as head coach in 2013. Buffalo came into this season with high expectations after losing just one key player, point guard Wes Clark, from a team that won a school-record 27 games and upset fourth-seeded Arizona as a No. 13 seed in the first round of last year’s NCAAs. “It’s a big win,” said Davonta Jordan, who had nine points and five assists. 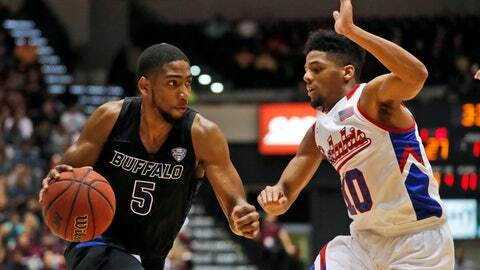 Buffalo: The Bulls are 3-0 for the first time since 1986, when they played at the Division III level, and they’ve already bolstered their NCAA Tournament credentials with two impressive nonconference wins. More opportunities will come when Buffalo plays at No. 15 Syracuse on Dec. 15 and No. 24 Marquette on Dec. 21. Southern Illinois: Picked to finish third in the Missouri Valley Conference after a second-place finish last season, the Salukis have held their own against two teams that won NCAA Tournament games last March. They held a lead in the second half of Friday night’s 71-59 loss at then-No. 2 Kentucky.